M. Izaki, et al., Appl. Phys. Lett., 68,2439(1996). M. Izaki, et al., Cryst. Growth & Design, 11,5533(2011). T. Shinagawa, M. Izaki, et al., J. Mater. Chem. C, 2(2014), 2908. 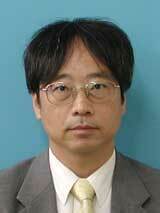 M. Izaki, et al., Progress in Photovoltaics: Rese. Appl., 24(2016), 397-404. 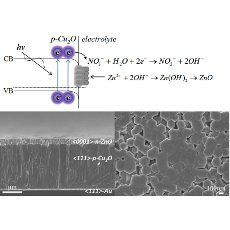 Change n surface potential by light irradiation for ZnO:Cu-phthalocyanine bulk-heterojunction photovoltaic device. The phase image represents the distribution of both components. 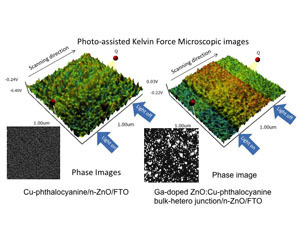 M. Izaki, et al., Advanced Materials, 15,2000(2003). M. Kobayashi, M. Izaki, et al., Appl. Phys. Lett., 106(2015), 081909. M. Izaki, et al., Phys. Status Solidi A, 214(2017), 1600473. M. izaki, et al., ACS Appl. Mater. Interface, 6(2014), 13461. 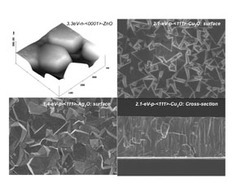 M. Zamzuri, M. Izaki, et al., Thin Solid Films, 595, 136(2015). M. Izaki, et al., AIP Advance, 7(2017), 035004. M. izaki, et al., ACS Appl. Mater. Interface, 5(2013), 9386. M. Izaki, et al., RSC Advance, 4(2014), 14956. M. Hiramoto, M. izaki, et al., electronics, 3(2014), 351. M. Izaki, et al., J. Appl. Phys., 120(2016), 185501. C. Ohashi, M. Izaki, et al., Advanced Materials, 1605619, 2017. Modern Electroplating, 5th edition, A John Wiley &Sons, NewYork, 2010.